Happy Halloween! I’m sure most everyone celebrated over the weekend, but why not stretch the fun into the week, right? We have a big afternoon/evening planned with attending our first neighborhood family Halloween party. But I can’t wait to show off my little candy corn! I must give Hailey’s Mema a lot of credit because she MADE this adorable costume after I showed her the one I saw on Pinterest. I absolutely love it and don’t think I’ve ever seen a cuter candy corn- thanks Mema! Now let’s talk treats. My favorite treat I enjoyed over the weekend? 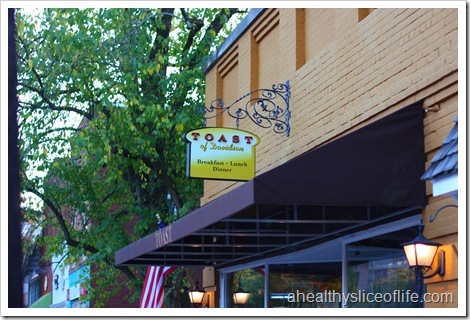 Now, as far as edible treats, I enjoy a Reese’s every now and then, but my favorite treat comes much more in the form of a delicious meal, which is exactly what we had at Toast in Davidson. 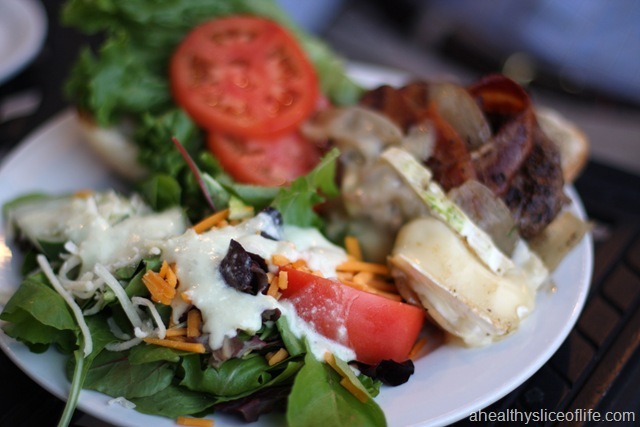 I know I talk about it all the time, but I love Davidson, and though I’ve enjoyed many breakfasts and lunches at Toast, we had never tried it for dinner. 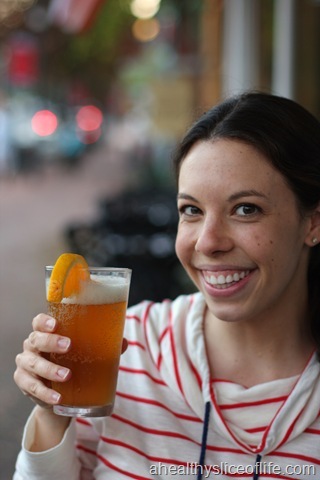 I started off with my favorite- Blue Moon! 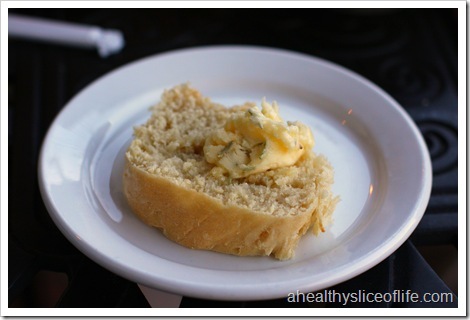 We perused the menu while snacking on the complimentary warm, fresh bread, served with a delicious soft butter that tasted like it had honey and rosemary in it. Remind me to try and recreate this. YUM. Toast is a place where ever. single. thing. on the menu sounds delicious, but we finally narrowed it down. We split a bowl of French Onion soup. I savored the warm, flavor-packed broth and Hubbs devoured the melty gruyere and mozzarella cheese. 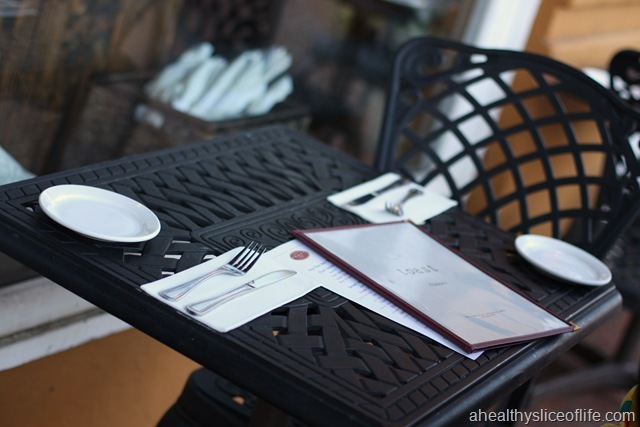 For my main, I ordered an appetizer – Butternut Squash Ravioli. Another YUM! It was packed with flavor thanks to the goat cheese and cranberries. I also noticed how pretty it was- what a great fall dish! Hubbs ordered the bistro burger, and I was clearly too enthralled with my ravioli to focus on taking a decent picture. As always, Toast never disappoints. Now, one last thought to stay with the TREAT theme? I loved reading every comment on Friday’s Fitness Fashion post– so thank you all for your thoughts! After reading through it all I gathered that Lululemon isn’t necessary, but that it may be a fun treat. So, that’s what I’m saving it for. Once I get back into working out the way I want to be, I’ll reward myself with a Lululemon piece to see for myself what I think. I’m leaning towards yoga pants. What was the best Halloween costume you saw this weekend? Aw, Hailey is so cute in that costume 🙂 I don’t even like candy corn but that one is adorable! Happy Halloween. 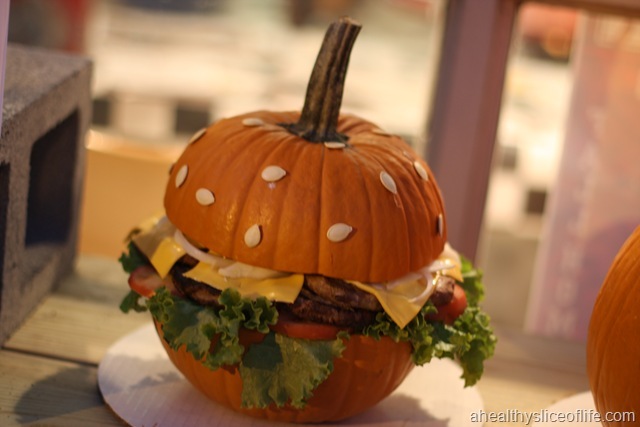 I saw a picture of that hamburger pumpkin on facebook — that thing is awesome! 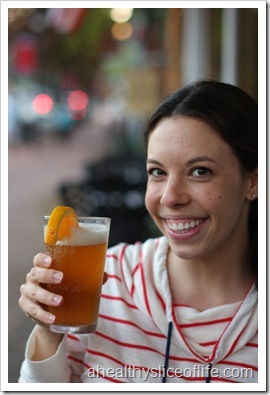 Blue Moon is usually my first choice of beer too – I think it tastes so good with so many foods. 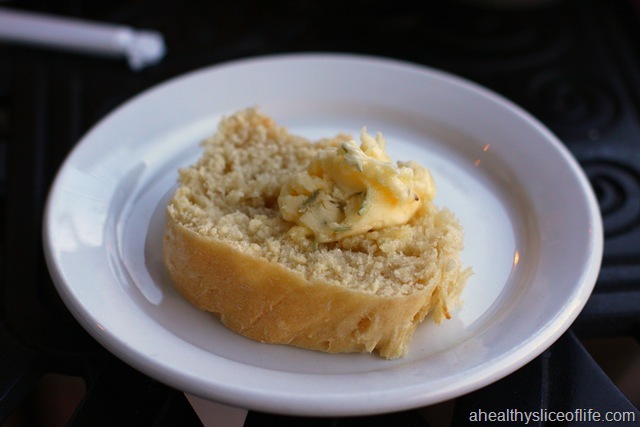 And you can totally make that rosemary/honey butter — I love flavored butter (we make roasted garlic butter sometimes and it tastes amazing on toast). your little candy corn baby is adorable! so cute. that ravioli looks good! 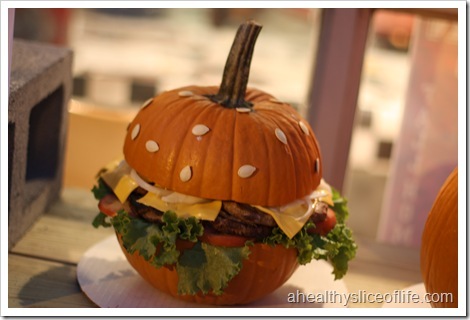 the pumpkin burger is awesome. happy halloween my dear! Hailey might be the cutest piece of candy corn that I’ve ever seen!!! Looks like a great meal! But I can assure you that I would be the one eating the cheese off that onion soup if I split it with my husband! So much about this post that I want to comment on! That pumpkin is AWESOME. I will have to share that photo with some burger loving friends. Your little candy corn is so so so cute. 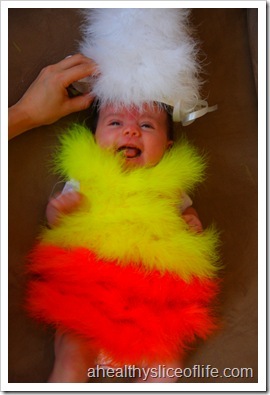 I cannot get enough of babies in Halloween costumes! 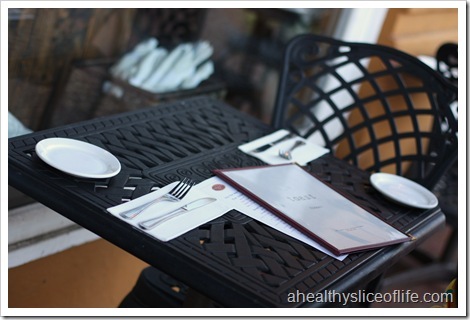 And that food at Toast looks amazing. 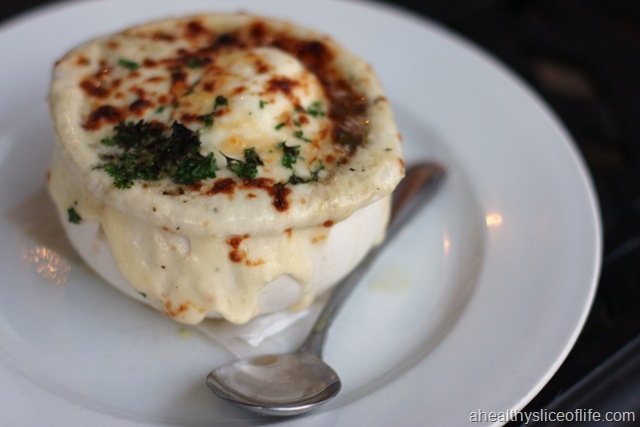 I don’t like French Onion Soup but the photo you took makes me want some. And that bread and butter – gah!! That pumpkin and costume are awesome! I was also very excited for a win against the Gators – Go DAWGS! 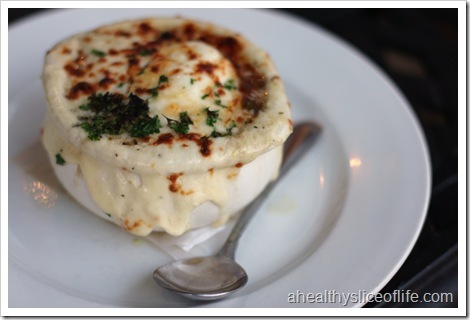 I love french onion soup and make it often in the crock pot…topped with gruyere cheese is a special treat! I love everything about this post! From the adorable candy corn to the amazing food (or so it appears), it’s all fab. I’m going to try and recreate a goat cheese n’ cranberry pasta recipe soon after seeing this. Saving Lululemon for a treat is an awesome idea! Cutest costume ever. That is all. I think someday we NEED to hang out together. I think I need to come to you. Just for some of that ravioli. Holy heavens!!!! That Candy Corn outfit is a riot!!! So cute!!! And that pumpkin? REALLY amazing. I love halloween!!!! Have a great one! And I think I am going to have to make some sort of meal inspired off that ravioli dish… all my favorite things in one meal!! I also love that costume your little one have worn for Halloween. So cute. 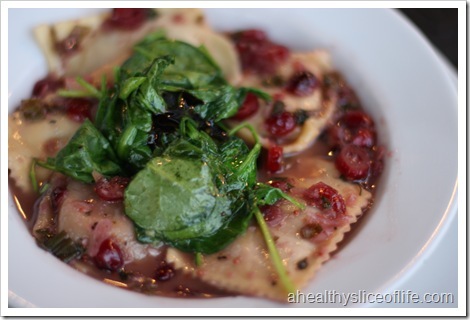 Butternut squash ravioli looks to die for! Im glad your starting to be able to get out more. And oh my gosh her costume is the cutest thing ever! Such a cute costume idea. I love people who think outside of the box when it comes to costume ideas. p.s. pretty sure i have that same dress from middle school haha. I know this may be semi rude to ask (maybe) but ive been reading your blog from the begining and find you to be so inspirational. 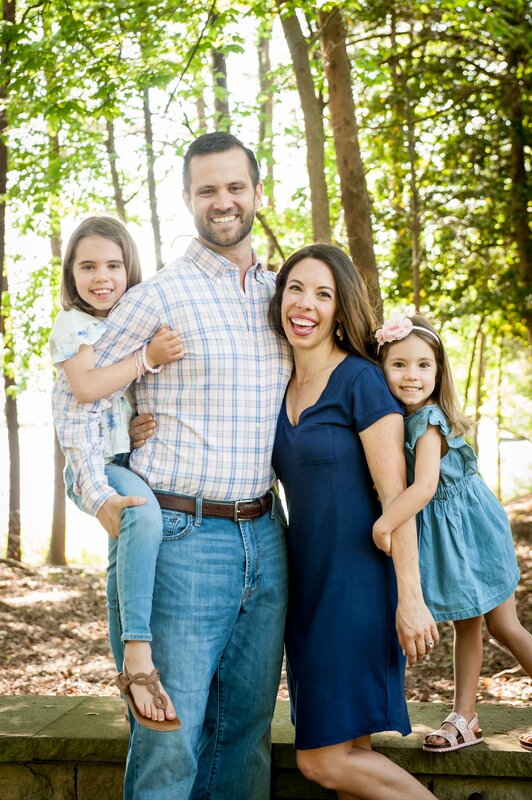 I recently caught the blogging bug and started my own. Except… i have no readers. Id feel honored if you would maybe give my lil blog a shot out on one of your posts? If not i understand, but it never hearts to ask right?? Hailey is too cute! I LOVE the idea of that ravioli! 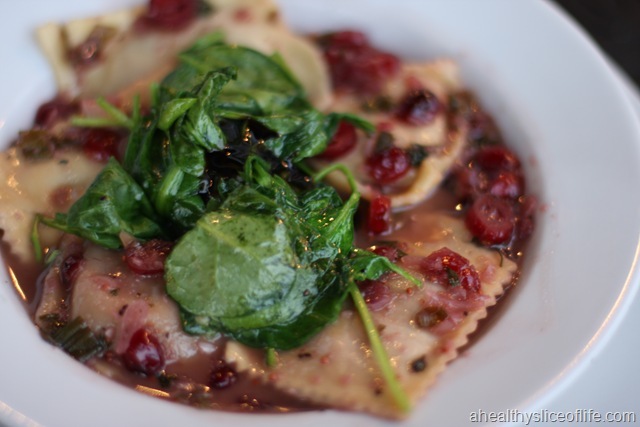 I get stuck in a rut when it comes to sauce for butternut squash ravioli- it’s always some kind of cinnamony/maple syrupy sauce, but this is cranberry and goat cheese is a fantastic idea! Oh my, Haley is adorable in that candy corn costume! And I love that pumpkin!!!! That costume is tooo cute. I cannot believe your mom made that, I am seriously impressed.